The first major game of the 2018 World Cup more than lived up to expectations, as the 36th Iberian derby produced a thrilling and high-quality match of that will be remembered as one of the games of the tournament. Playing for the first time under former director of football Fernando Hierro, Spain came out in a 4-2-3-1, Koke Resurreción playing alongside Sergio Busquets in the deeper midfield roles, Diego Costa up top, and Real Madrid’s Nacho Fernández starting at right back in place of Julen Lopetegui favorite, Álvaro Odriozola. Though on the more conservative side of Spain’s potential line-ups, it would not have raised eyebrows had it been selected by former manager Lopetegui, fired only two days ago. Fernando Santos also went with an anticipated 4-4-2, but with the surprise inclusion of Gonçalo Guedes up top alongside Cristiano Ronaldo rather than on the left, where Bruno Fernandes came in. Portugal’s style of play, however, was much more positive than it had been during the Euros. Whether this constitutes an evolution of Santos’s side or simply a game-specific tactic remains to be seen, but in the first quarter of the game they were the more threatening side, effectively pressing Spain and taking the game to them. Portugal’s early penalty, created and taken by Ronaldo, felt like a deserved result of their positive play. They were a joy to watch and could win hearts and minds if they are able to maintain this style into the knockout stage. But, to modify the old saying, it was a half of two halves. Almost exactly at its midpoint, Guedes was unable to complete a promising breakaway with Ronaldo, and a long ball from Busquets was won by Costa (with the help of an uncalled forearm into Pepe’s chin in the ariel duel–Pepe’s theatrical response, grabbing his forehead to signal for a stoppage, may have swayed the VAR official in deciding that this was not a clear and obvious error on referee Néstor Pitana’s part). Costa took his time, toying with defender José Fonte before scoring a well-placed individual goal. Spain had gotten themselves into the game at this point, and from there on they absolutely dominated the rest of the half. Isco hammered the crossbar at 26′, Andres Iniesta narrowly missed the right post at 35′, and at 38′ they had a full minute of possession, 35 consecutive passes, leading to a corner kick. Spain could hardly have been more dominant. But it was Ronaldo who scored at 44′ off a long ball beautifully taken down on the thigh and slipped to him by Guedes, and then badly bundled into goal by a distracted David de Gea (immediately before Ronaldo released his shot, de Gea appeared to wave someone off, suggesting he was thinking about his teammates instead of solely on the ball). Portugal went into halftime with an undeserved lead. Spain came out in the second half in a 4-3-3, Isco Alarcón now playing on the left wing with Iniesta at inside left and Busquets holding behind him and Koke. Presumably the change was designed to maximize their advantage in possession, and they continued to dominate the game. Two quick goals were the reward, Costa scoring off a free kick and then Nacho Fernández half-volleying a loose ball magnificently in, an early contender for goal of the tournament. 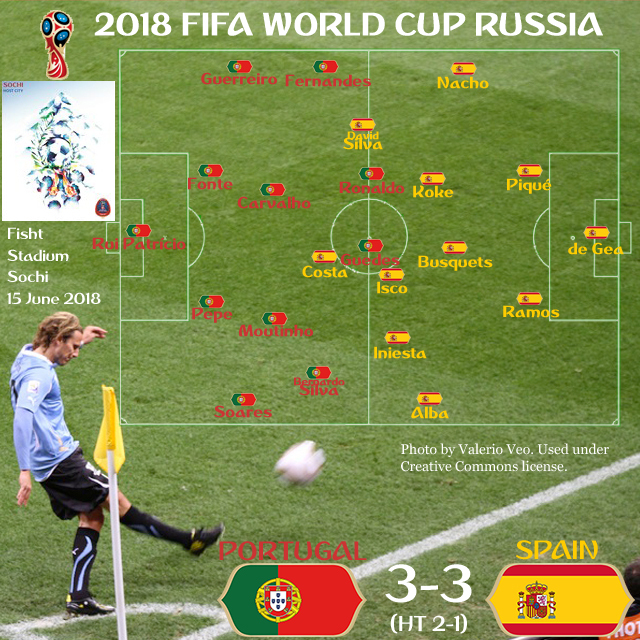 With 30′ left and a one-goal lead, Spain appeared to be passing the game to death, albeit in a relatively positive fashion that saw them continuing to advance toward Portugal’s goal. The game did, indeed, seem finished. And then Gerard Piqué pushed Ronaldo in the back at the top of his box to concede a dangerous free kick in the 86th minute. Not one to shy away from pressure, Ronaldo chose to bare his free-kicking right thigh before rather than after striking the ball. When he did strike it, the result was a nearly perfect free kick, one that will probably not be bettered in the tournament, and Portugal had a tie that surely felt like a victory. While Spain were clearly the better side for the majority of the game, Ronaldo produced one of the finest individual performances in recent memory. If he can continue to dominate games in this manner, and especially if Portugal is able to maintain the attractive style of play with which they opened this game, this could be his tournament. For their part, Spain played a wonderful game that should (though probably won’t) put to bed questions about the impact of Lopetegui’s firing–at least for the time-being. In truth, neither of these teams will really be judged until the knockout round, but this opener will last long in memories of Russia 2018. Well, the result was fair in the end…I wish Australia vs France had also ended in a draw.